We currently have openings for 8 Servant Leader Interns. CDF’s mission is to ensure every child a Healthy Start, a Head Start, a Fair Start, a Safe Start and a Moral Start in life and successful passage to adulthood with the help of caring families and communities. The CDF Freedom Schools® program is a direct service initiative coordinated nationally by the Children’s Defense Fund in partnership with local community organizations. It is an educational and cultural enrichment program that provides summer options for children and strengthens family and community involvement. The program serves children in grades kindergarten through twelfth for six to eight weeks. The activity based Integrated Reading Curriculum, which is aligned to the Common Core State Standards, integrates reading, conflict resolution, and social action, and is designed to promote social, cultural, and historical awareness. A multi-year assessment of CDF Freedom Schools program sites continuously demonstrates the effectiveness of the Integrated Reading Curriculum, which has proven to avert children’s summer learning loss in reading achievement. College-age young adults and recent college graduates play a key role in the CDF Freedom Schools program in the position of Servant Leader Intern. Each CDF Freedom Schools Servant Leader Intern serves as the teacher for a maximum of 10 students. Servant Leader Interns have access to further leadership development and networking opportunities geared toward continued direct service and advocacy on behalf of children and families. • Supervise and maintain safety of students at all times. • Set up, manage and break down classroom space according to standards developed by CDF. • Engage a maximum of 10 students per class in the Integrated Reading Curriculum as outlined in the guide provided by CDF. • Attend all required trainings. • Maintain the safety of all students at the site. • Serve as Harambee leaders, afternoon activities facilitators, and field trip chaperones. • Collaborate with other staff to establish and maintain a supportive and structured environment for the students entrusted in their care. • Report any issues or concerns regarding students in the program to the Site Coordinator. • Implement the CDF Freedom Schools Integrated Reading Curriculum with fidelity. • Maintain or have graduated with at least a 3.0 G.P.A. 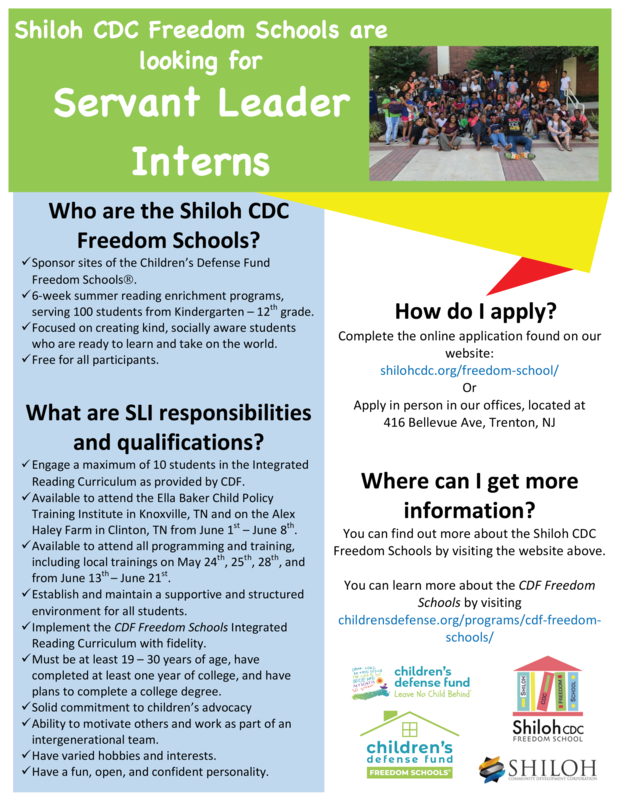 If you run into any trouble completing the application, please email Jasmine Ross at jasmineross@shilohcdc.org or call (609) 390-0034 ext 310 for assistance. *Please note that you will be required to upload your current resume and most recent transcripts to apply.